Cabo Del Mar Condos is a gated community located in northwest Huntington Beach near the Huntington Harbour. The community of Cabo Del Mar is located off Warner Avenue and backs to the Bolsa Chica Ecological Reserve which has great trails for walking and viewing local wildlife. Cabo Del Mar is conveniently located near shopping, dining and the Bolsa Chica State Beach. Click here to see all available condos in Cabo Del Mar Huntington Beach. Cabo Del Mar Condos were built in 1983 and consist of 288 units ranging from Studios to 2 bedroom units. The smallest floor plan in Cabo Del Mar is a studio with around 535 sq/ft of living space. The one bedroom models are a little larger and offer 761 sq/ft of living space. The largest floor plan is a 2 bedroom / 2 bath model which ranges from 923 sq/ft up to 1,100 sq/ft of living space. All units in the complex have some sort of outdoor space whether it’s a patio or balcony. All parking is located in the subterranean parking garage and is assigned by space. 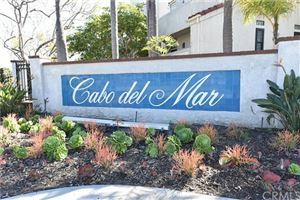 Cabo Del Mar offers many amenities to it’s residents and guests including a Clubhouse, swimming pool and spa, tennis courts, racquetball court and sauna as well as greenbelts throughout the community. There is an HOA fee associated with each unit and it can vary depending on the model. This fee covers all of the amenities as well as the water/sewer, trash and insurance for each unit in Cabo Del Mar.